, one of the most eminent English antiquaries, was born in the Old Bailey, London, May 2, 1551. His father, Samson Camden, was a native of Lichfield, whence he was sent very young to London, where he practised painting, and settling in London, became a member of the company of Puinter-stainers. The inscription on the cup left by his son to the company calls him Pictor Londinensis, which may refer either to his profession or to his company. His mother was of the ancient family of the Curwens of Workington in Cumberland. Their son received his first education at Christ’s hospital, which was founded the year after his birth by king Edward VI. ; but the records of that house being destroyed in the fire of London, the date of his admission is lost. Bishop Gibson treats his admission at Christ’s hospital as a fiction, because not mentioned by himself; but as it is by Wheare, who pronounced his funeral oration very soon after his death, it seems to have some foundation, especially if we consider the lowness of his circumstances, and his dependence on Dr. Thornton at Oxford. Dr. Smith (his biographer) says, some infer from hence, that he had lost his father, and was admitted as an orphan; but it is certain Wheare does not give it that turn. Being seized with the plague in 1563, he was removed to Islington, or perhaps was seized with it there, “peste correptus Islingtonue” but on his recovery, he completed his education at St. Paul’s school; where under Mr. Cook or Mr. Malin, he | made such progress in learning as laid the foundation of his future fame. From this school he was removed when about fifteen, years old, in 1566, to Oxford, and entered as a servitor at Magdalen college; and in the school belonging to that college perfected himself in grammar learning under Dr. Thomas Cooper, afterwards bishop of Lincoln and Winchester; but being disappointed of a demi’s place, he removed to Broadgate-hall, now Pembroke college, by the invitation of Dr. Thomas Thornton, canon of Christ church, his patron and tutor, and who had the honour to be tutor both to Camden and to sir Philip Sidney. Camden left behind him in Broadgate-hall a signal mark of the respect paid him by his contemporaries in the short Latin graces composed by him, which were used many years after by the scholars of this society. Three years after he removed from hence to Christ church, on the promotion of Dr. Thornton to a canon ry there. This kind patron provided for him during the rest of his continuance at the university, and he lived in his patron’s lodgings. At this time his acquaintance commenced with the two Carews, Richard and George; the latter of whom was by James I. created baron Clopton, and by Charles I. earl of Totness; and it has been supposed, as they were both antiquaries, their conversation might give Mr. Camden a turn to that study, which he himself informs us he had strongly imbibed before he left school, and improved at Oxford. He was also acquainted with John Packington, Stephen Powel, and Edward Lucy, knights. About this time by the encouragement of his friends, he stood for a fellowship at All Souls, but met with a repulse, through the interest of the Popish party, on account of his zeal for the church of England. He met with a second disappointment in his supplication to be admitted to the degree of bachelor of arts in 1570, and upon this he quitted Oxford, and came up to London the next year, being now about twenty. He pursued his studies under the patronage of Dr. Gabriel Goodman and Dr. Godfrey Goodman his brother, who supplied him both with money and books. In 1573, he applied again for the same degree, and seems to have taken it, but never completed it by determinations. In June 1588, we find him supplicating the convocation by the name of William Camden, B. 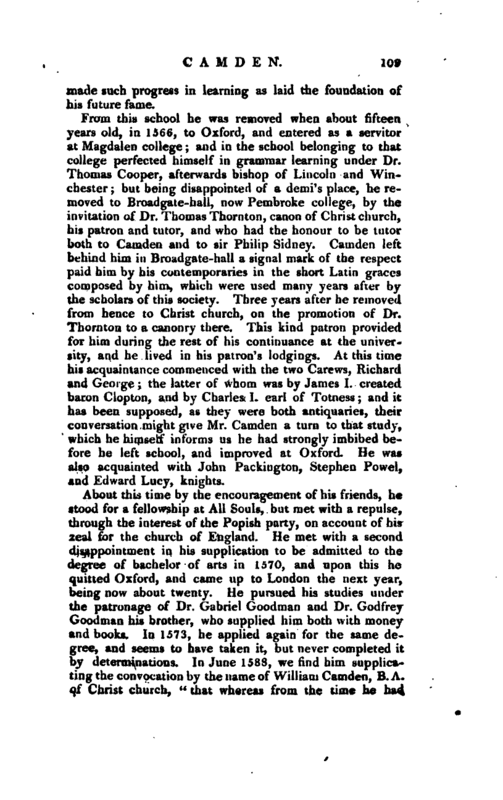 A. of Christ church, “that vvhereas from the time he had | taken the degree of bachelor, he had spent sixteen years in the study of philosophy and the liberal arts, he might be dispensed with for reading three solemn lectures, and be allowed to proceed.” His supplication was granted on condition that he stood in the following act, which it seems his other engagements would not permit; for Wood says, his name is not in the registers. When he attended the funeral of sir Thomas Bodley in 1613, his fame was so. great, that the university voluntarily offered him the degree of master of arts, but whether he accepted it does not appear. Upon leaving the university, he seems to have made the tour of great part of England; and in 1575, by the interest of his friend Dr. Gabriel Goodman, dean of Westnii nster, he obtained the place of second master of Westminster school. The little leisure he could spare from this important charge he devoted to his favourite study. He was not content with pursuing it in his closet, but made excursions over the kingdom every vacation. In 1582, for example, he took a journey through Suffolk into Yorkshire, and returned by Lancaster. When at home he searched into the manuscript collections of our own writers, and the published writings of foreigners respecting us. 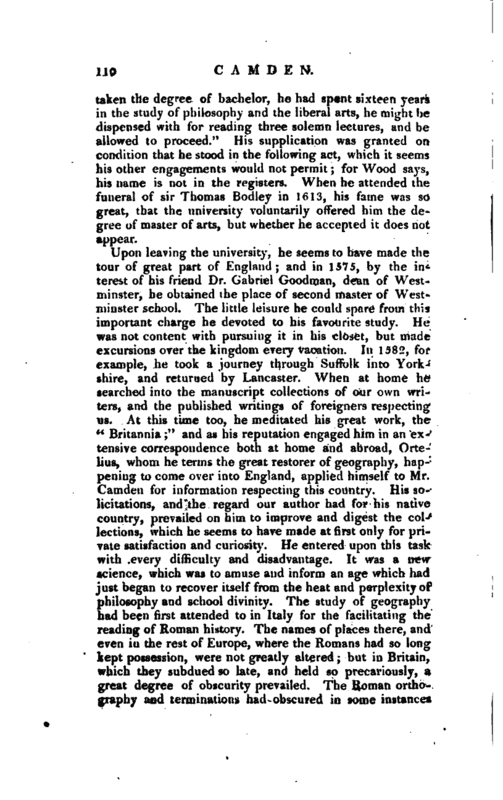 At this time too, he meditated his great work, the “Britannia;” and as his reputation engaged him in an extensive correspondence both at home and abroad, Ortelius, whom he terms the great restorer of geography, happening to come over into England, applied himself to Mr. Camden for information respecting this country. His solicitations, and the regard our author had for his native country, prevailed on him to improve and digest the collections, which he seems to have made at first only for private satisfaction and curiosity. He entered upon this task with every difficulty and disadvantage. It was a new science, which was to amuse and inform an age which had just began to recover itself from the heat and perplexity of philosophy and school divinity. The study of geography had been first attended to in Italy for the facilitating the reading of Roman history. The names of places there, and even in the rest of Europe, where the Romans had so long kept possession, were not greatly altered; but in Britain, which they subdued so late, and held so precariously, a great degree of obscurity prevailed. The Roman orthography and terminations had obscured in some instances | the British names; but the Saxons, who succeeded the Romans here, as they gained a firmer possession, made an almost total change in these as in every thing else. Upon their expulsion by the Normans, their language ceased to be a living one, while that of the Britons was preserved in a corner of the island. Very soon after the coiiquesj there were few who could read the Saxon characters. In tracing the Roman geography of Britain, Mr. Camden might he assisted by Ptolemy, Antoninus’s Itinerary, and the Notitia; but before he could become acquainted with the Saxon geography, it was necessary for him to make himself master of a language which had ceased for above 400 years. The few written remains of it were almost divided between three collections; that of archbishop Parker, now at Bene’t college, Cambridge; that of archbishop Laud, now at Oxford; and that of sir Robert Cotton, now in the British Museum. After ten years’ labour Mr. Camden published his “Britannia” in 1586, dedicated to William Cecil lord Burleigh, lord treasurer to queen Elizabeth. What a favourable reception it met with appears from the number of editions it passed through; for in the compass of four years there were three at London, one at Frankfort, 1590, one in Germany, and a fourth at London in 1594. The title which he retained in all editions was “Britannia, sive florentissimorum regnorum Angliie, Scotiee, Hiberniae, et insularum adjacentium, ex intima antiquitate, chorographica descriptio.” The dedication is dated May 2, 1586, so that he finished this great work precisely at the age of thirty-five; and yet, as he informs us himself, he devoted to it only his spare hours and holidays, the duties of his office ingrossing all the rest of his time. As each new edition received large corrections and improvements from its author, he took a journey into Devon in 1589, and in June that year was, as he tells us in his diary, at Ilfracomb, which is a prebend of the church of Salisbury, and had been bestowed on him that year by Dr. John Piers, then bishop of that see and his intimate friend; and he had been installed into it by proxy Feb. 6. This preferment he held till his death; and when bishop Abbot held his general visitation at Whitsuntide in 1617, he excused himself from attending on account of his age, being then seventy, and was allowed to appear by proxy. The expence of this and other journies was defrayed by | his friend Mr. Godfrey Goodman. In 1590 he visited Wales in company with the famous Dr. Godwin, afterwards bishop of Landatf‘and Hereford. On Oct. 23, 1592, he was attacked with a quartan ague, which, for a long while, baffled the help of physic, and brought him very low. 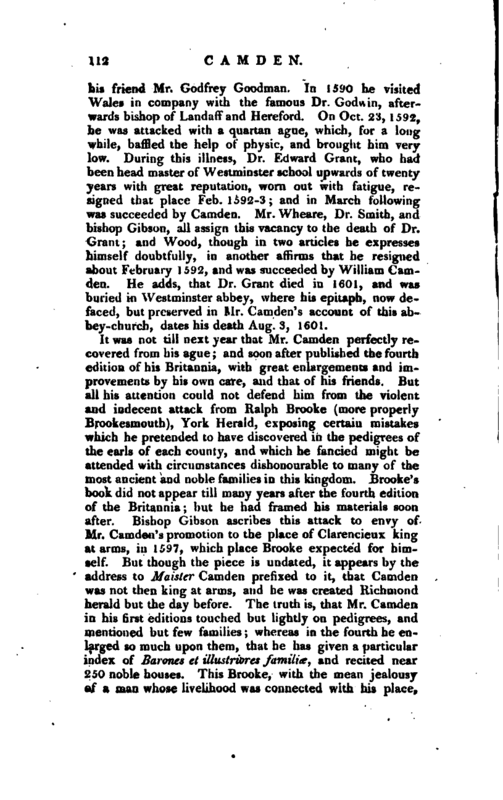 During this illness, Dr. Edward Grant, who had been head master of Westminster school upwards of twenty years with great reputation, worn out with fatigue, resigned that place Feb. 1592-3; and in March following was succeeded by Camden. Mr. Wheare, Dr. Smith, and bishop Gibson, all assign this vacancy to the death of Dr. Grant; and Wood, though in two articles he expresses himself doubtfully, in another affirms that he resigned about February 1592, and was succeeded by William Camden. He adds, that Dr. Grant died in 1601, and was buried in Westminster abbey, where his epitaph, now defaced, but preserved in Mr. Camden’ s account of this abbey-church, dates his death Aug. 3, 1601. It was not till next year that Mr. Camuen perfectly recovered from his ague; and soon after published the fourth edition of his Britannia,‘ with great enlargements and improvements by his own care, and tliat of his friends. But all his attention could not defend him from the violent and indecent attack from Ralph Brooke (more properly Brookesmouth), York Herald, exposing certain mistakes which he pretended to have discovered in the pedigrees of the earls of each county, and which he fancied might be attended with circumstances dishonourable to many of the most ancient and noble families in this kingdom. Brooke’s book did not appear till many years after the fourth edition of the Britannia; but he had framed his materials soon after. Bishop Gibson ascribes this attack to envy of Mr. Camden’s promotion to the place of Clarencieux king at arms, in 1597, which place Brooke expected for himself. 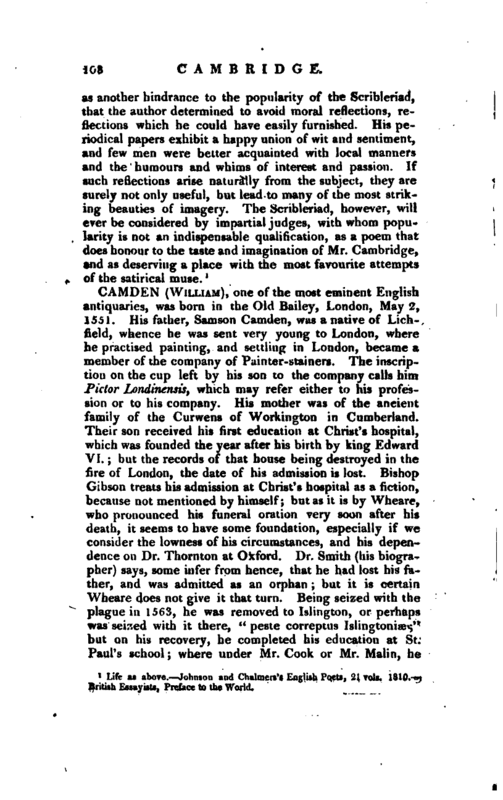 But though the piece is undated, it appears by the address to Maister Camden prefixed to it, that Camden was not then king at arms, and he was created Richmond herald but the day before. 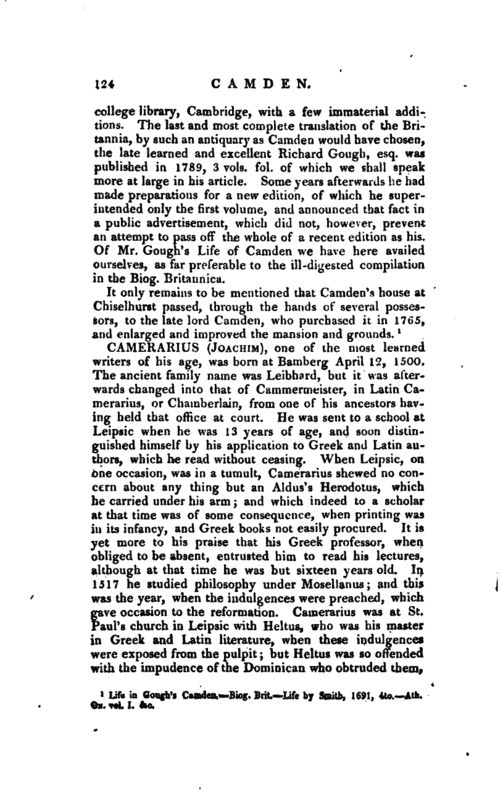 The truth is, that Mr. Camden in his first editions touched but lightly on pedigrees, and mentioned but few families whereas in the fourth he enlarged so much upon them, that he has given a particular index of Barones et illustriores famili<e, and recited near 250 noble houses. This Brooke, with the mean jealousy of a man whose livelihood was connected with his place, | considered as an invasion on the rights of the college. This put him on examining these pedigrees, and on wishing to have them corrected, as Mr. Camden appears to have been ever ready to have his mistakes set right. Brooke tells us, indeed, that what he offered him for the fifth edition did not meet with that favourable reception he expected even before Camden professed himself an herald officially, and that foreigners, misled by his former editions, had blundered egregiously. 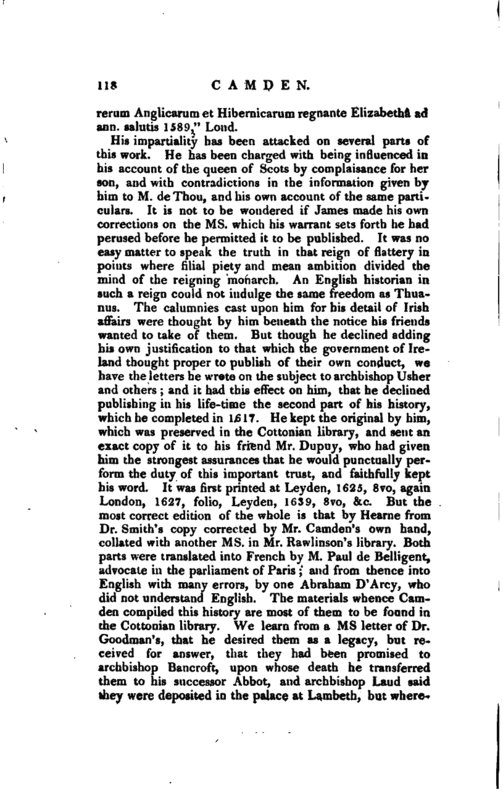 He complains too, that he had been disturbed in writing, and much more in printing it, by Mr. Camden’s friends. 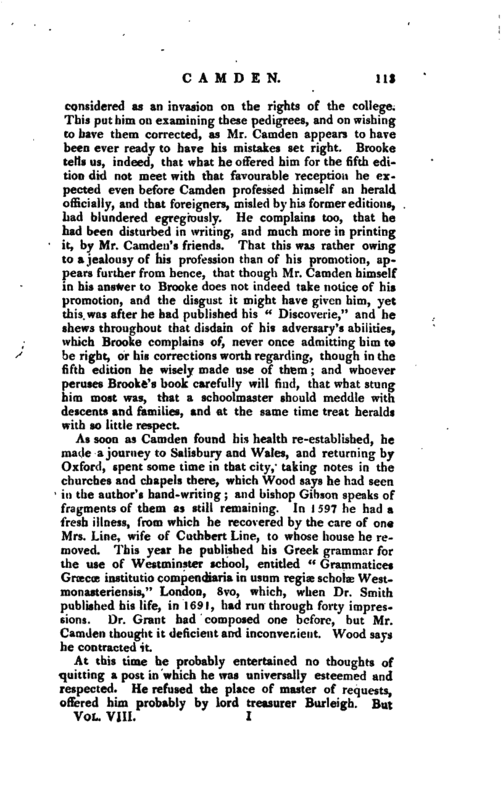 That this was rather owing to a jealousy of his profession than of his promotion, appears further from hence, that though Mr. Camden himself in his answer to Brooke does not indeed take notice of his promotion, and the disgust it might have given him, yet this was after he had published his “Discoverie,” and he shews throughout that disdain of his adversary’s abilities, which Brooke complains of, never once admitting him to be right, or his corrections worth regarding, though in the fifth edition he wisely made use of them; and whoever peruses Brooke’s book carefully will find, that’what stung him most was, that a schoolmaster should meddle with descents and families, and at the same time treat heralds with so little respect. As soon as Camden found his health re-established, he made a journey to Salisbury and Wales, and returning by Oxford, spent some time in that city, taking notes in the churches and chapels there, which Wood says he had seen in the author’s hand-writing; and bishop Gibson speaks of fragments of them as still remaining. In 1597 he had a fresh illness, from which he recovered by the care of one Mrs. Line, wife of Cuthbert Line, to whose house he removed. This year he published his Greek grammar for the use of Westminster school, entitled “Grammatices Graecoe institutio compendiaria in usum regias scholas Westmonasteriensis,” London, 8vo, which, when Dr. Smith published his life, in 1691, had run through forty impressions. Dr. Grant had composed one before, but Mr. Camden thought it deficient and inconvenient. Wood says he contracted it. At this time he probably entertained no thoughts of quitting a post in which he was universally esteemed and respected. He refused the place of master of requests, offered him probably by lord treasurer Burleigh. But | before the end of the year he quitted it for one in the Heralds’ college. Richard Leigh, Clarencieux king at arms, dying Sept. 23, sir Fulk Greville, Camden’s intimate friend, solicited that office for him, which was immediately granted. But, because it was not usual for a person to rise to that dignity without having first been a herald, he was Oct. 22, created Richmond herald, and the next day Clarencieux. Bishop Gibson remarks, that lord Burleigh was offended with Camden for obtaining this preferment by any other interest than his; but, on Mr. Camden’s representing it to be the free thought of sir Fulk Greville, he was reconciled to him, and continued his patronage during the remainder of his life. Being now more at liberty, he travelled in 1600 as far as Carlisle, with his intimate friend Mr. (afterwards sir) Robert Cotton, and having surveyed the northern counties, returned to London in December. This year he published his account of the monuments in Westminster abbey, “Reges, Regina?, Nobiles, et alii in ecclesia collegiata B. Petri Westmonasterii sepulti, usque ad annum reparatae salutis 1600,” 4to; which, though no more than a collection of epitaphs, has preserved many that have been since destroyed or effaced. He reprinted it with enlargements in 1603, and 1606. This year also, came out a fifth edition of his Britannia, to which he added “An apology to the reader,” in answer to what Ralph Brooke had published to the prejudice of his work. The original difference related only to some mistakes which Brooke imagined he had discovered. But when he fancied himself under the necessity of appealing to the world and to the earl of Essex, then earl marshal, and his patron, he brought in other matter, foreign to his purpose, cljarging Camden with errors in the pedigrees of noble families, with not acknowledging the assistance he derived from Glover’s papers in lord Burleigh’s library, and from Leland, whom he pretends he had pillaged largely. 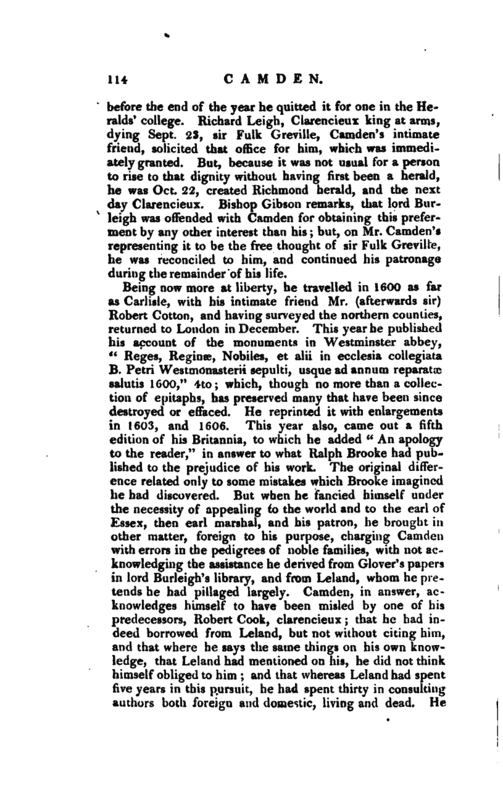 Camden, in answer, acknowledges himself to have been misled by one of his predecessors, Robert Cook, clarencieux; that he had indeed borrowed from Leland, but not without citing him, and that where he says the same things on his own knowledge, that Leland had mentioned on his, he did not think himself obliged to him; and that whereas Leland had spent five years in this pursuit, he had spent thirty in consulting authors both foreign and domestic, living and dead. He | concludes with rallying his antagonist, as utterly ignorant of his own profession, incapable of translating or understanding the Britannia, and offers to submit the disputed points to the earl marshal, the college of heralds, the society of antiquaries, or four persons learned in these studies. This did not prevent Brooke from writing “A Second Discoverie of Errors,” in which he sets down the passages from Camden, with his objections to it in his first book; then Camden’s reply, and last of all, his own answer: and in the appendix in two columns, the objectionable passages in the edition of 1594, and the same as they stood in that of 1600. This was not printed till about 100 years after the death.of its author, by Mr. Anstis, in 1723, 4to. The story which Mr. Camden, in his Annals, and Dr. Smith tell of Brooke’s dirty treatment of sir William Segar, another officer in the college, whom he had a pique against, in 1616, will justify us in believing him capable of any thing. 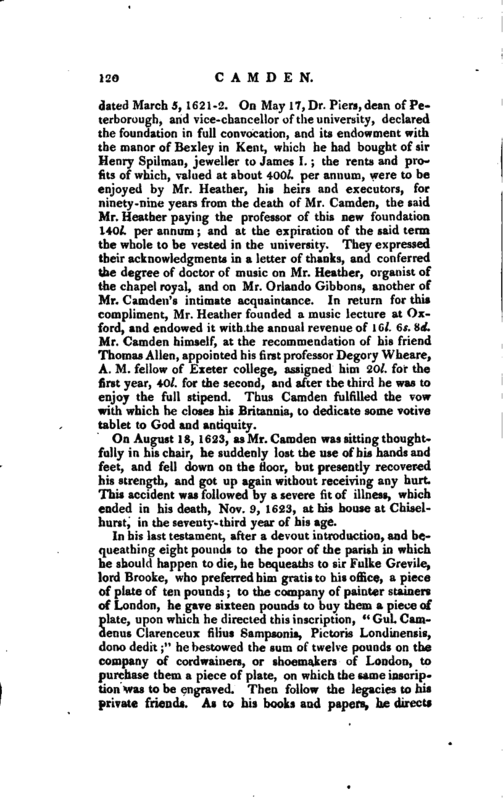 In 1602, Mr. Camden was again visited by a fever, from which he was recovered by the care of his friend Mr. Heather, afterwards the founder of the music lecture at Oxford. He escaped the plague in 1603, by returning to his friend Cotton’s seat at Connington; and this year a collection of our historians, Asser, Walsingham, De la More, Gul. Gemeticensis, Gir. 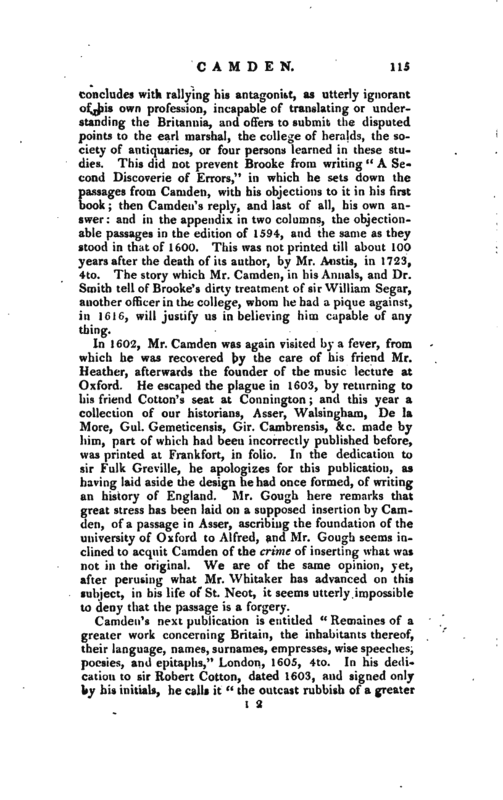 Cambrensis, &c. made by him, part of which had been incorrectly published before, was printed at Frankfort, in folio. 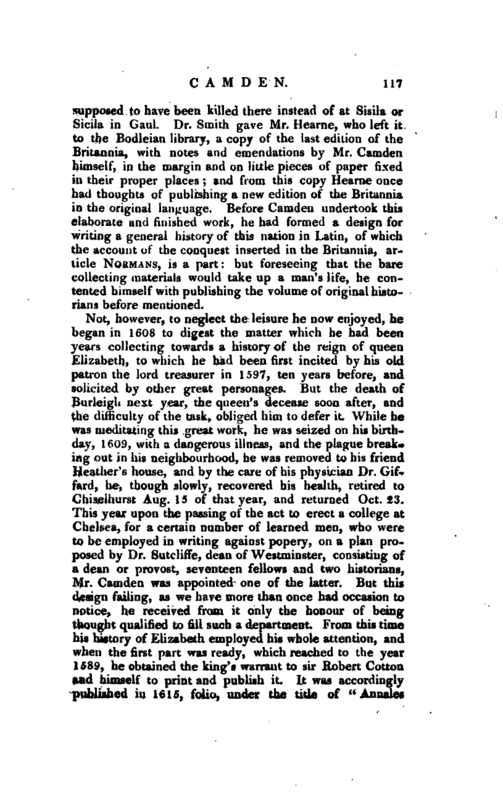 In the dedication to sir Fulk Greville, he apologizes for this publication, as having laid aside the design he had once formed, of writing an history of England. Mr. Gough here remarks that great stress has been laid on a supposed insertion by Camden, of a passage in Asser, ascribing the foundation of the university of Oxford to Alfred, and Mr. Gough seems inclined to acquit Camden of the crime of inserting what was not in the original. We are of the same opinion, yet, after perusing what Mr. Whitaker has advanced on this subject, in his life of St. Neot, it seems utterly impossible to deny that the passage is a forgery. Camden’s next publication is entitled “Remaines of a greater work concerning Britain, the inhabitants thereof, their language, names, surnames, empresses, wise speeches, poesies, and epitaphs,” London, 1605, 4to. In his dedication to sir Robert Cotton, dated 1603, and signed only by his initials, he calls it “the outcast rubbish of a greater | and more serious work;” so that Dr. Smith mistakes when he dates its publication 1604, contrary to the express note of its author in his Diary. The number of the editions it has run through (not less than seven), and the additions made to it in 1636, or earlier, by sir John Philipot, Somerset herald, and W. D. gent, are proofs of its value, notwithstanding the slight put upon it by bishop Nicolson. It is a kind of common place from his Britannia, and has preserved a number of curious things. Many other of his lesser essays have been printed by Hearne in his “Collection of curious discourses,” and more were added to the second edition of that work in 177 1; which may be considered as the earliest transactions of the Society of Antiquaries, of which Mr. Camden was a distinguished member. In 1606, Mr. Camden began a correspondence with the celebrated president De Thou, which was continued till the death of the latter. Five of the president’s letters, ending 1615, are printed by Dr. Smith among Camden’s Epistles, 54, 59, 71, 99, 111, acknowledging the information he received from him relative to the affairs of this island. Upon the discovery of the powder-plot, the king thinking it proper to put the reformed churches abroad on their guard against the enemies of their religion, as well as to satisfy foreign princes of all religions of the justice of his proceedings, made choice of Mr. Camden to translate the whole account of the trial of the conspirators into Latin, which he performed with great accuracy, elegance, and spirit. It was published in 1607, 4to, by John Norton the king’s printer, under the title of “Actio in Henricum Garnetum societatis Jesuiticoe in Anglia superiorem et caeteros qui proditione longe immanissima sereniss. Brit. Mag. regem et regni Anglias ordines e medio tollere conabantur,” &c. and presently was put into the list of books prohibited by the inquisition. Mr. Camden being confined many months in consequence of a hurt in his leg by a fall from his horse, Sept. 7, 1607, employed himself in putting the last hand to the complete edition of his Britannia in folio, considerably augmented, adorned with maps, and applauded by a variety of poetical compliments from his friends both at home and abroad. He did not to the last give up thoughts of revising and enlarging it, for in 1621, we find him at Sandhurst in Kent, searching without success for a camp of Alexander Severus, who was, without any foundation, | supposed to have been killed there instead of at Sisila or Sicila in Gaul. 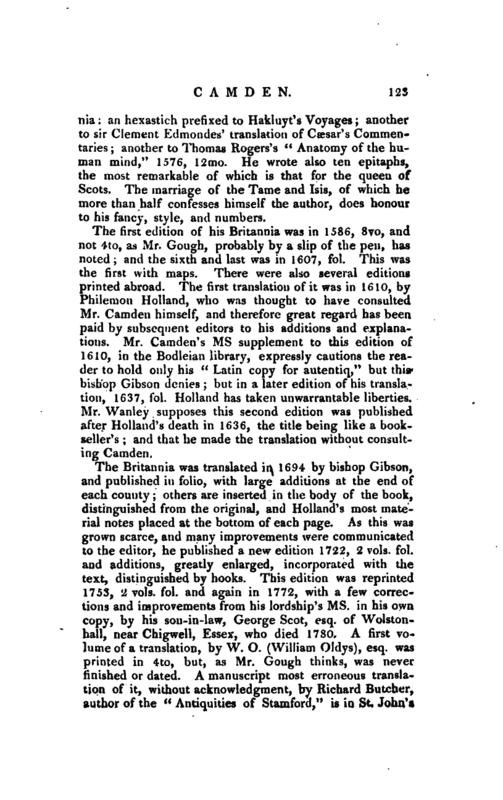 Dr. Smith gave Mr. Hearne, who left it to the Bodleian library, a copy of the last edition of the Britannia, with notes and emendations by Mr. Camden himself, in the margin and on little pieces of paper fixed in their proper places; and from this copy Hearne once had thoughts of publishing a new edition of the Britannia in the original language. Before Camden undertook this elaborate and finished work, he had formed a design for writing a general history of this nation in Latin, of which the account of the conquest inserted in the Britannia, article Normans, is a part: but foreseeing that the bare collecting materials would take up a man’s life, he contented himself with publishing the volume of original historians before mentioned. Not, however, to neglect the leisure he now enjoyed, he began in 1608 to digest the matter which he had been years collecting towards a history of the reign of queen Elizabeth, to which he had been first incited by his old patron the lord treasurer in 1597, ten years before, and solicited by other great personages. But the death of Burleigh next year, the queen’s decease soon after, and the difficulty of the task, obliged him to defer it. While he was meditating this great work, he was seized on his birthday, 1609, with a dangerous illness, and the plague breaking out in his neighbourhood, he was removed to his friend Heather’s house, and by the care of his physician Dr. Giffard, he, though slowly, recovered his health, retired to Chiselhurst Aug. 15 of that year, and returned Oct. 23. 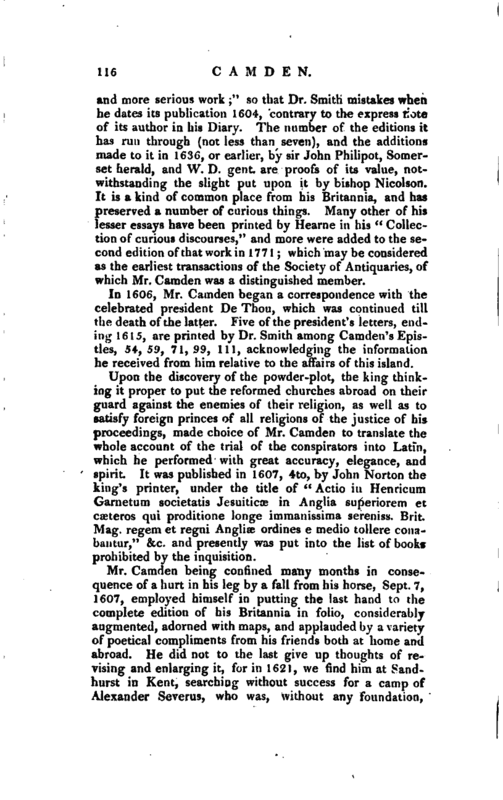 This year upon the passing of the act to erect a college at Chelsea, for a certain number of learned men, who were to be employed in writing against popery, on a plan proposed by Dr. Sutcliffe, dean of Westminster, consisting of a dean or provost, seventeen fellows and two historians, Mr. Camden was appointed one of the latter. But this design failing, as we have more than once had occasion to notice, he received from it only the honour of being thought qualified to fill such a department. From this time his history of Elizabeth employed his whole attention, and when the first part was ready, which reached to the year 1589, he obtained the king’s warrant to sir Robert Cotton and himself to print and publish it. It was accordingly published in 1615, folio, under the title of “Annales | rerum Anglicarum et Hibernicarum regnante Elizabetha ad ann. salutis 1589,” Lond. His impartiality has been attacked on several parts of this work. He has been charged with being influenced in his account of the queen of Scots by complaisance for her son, and with contradictions in the information given by him to M. deThou, and his own account of the same particulars. It is not to be wondered if James made his own corrections on the ms. which his warrant sets forth he had perused before he permitted it to be published. It was no easy matter to speak the truth in that reign of flattery in points where filial piety and mean ambition divided the mind of the reigning monarch. An English historian in such a reign could not indulge the same freedom as Thuanus. The calumnies cast upon him for his detail of Irish affairs were thought by him beneath the notice his friends wanted to take of them. But though he declined adding his own justification to that which the government of Ireland thought proper to publish of their own conduct, we have the letters he wrote on the subject to archbishop Usher and others and it had this effect on him, that he declined publishing in his life-time the second part of his history, which he completed in 1617. He kept the original by him, which was preserved in the Cottonian library, and sent an exact copy of it to his friend Mr. Dupuy, who had given him the strongest assurances that he would punctually perform the duty of this important trust, and faithfully kept his word. It was first printed at Leyden, 1625, 8vo, again London, 1627, folio, Leyden, 1639, 8vo, &c. But the most correct edition of the whole is that by Hearne from Dr. Smith’s copy corrected by Mr. Camden’s own hand, collated with another ms. in Mr. Rawlinson’s library. Both parts were translated into French by M. Paul de Belligent, advocate in the parliament of Paris; and from thence into English with many errors, by one Abraham D’Arcy, who did not understand English. The materials whence Camden compiled this history are most of them to be found in the Cottonian library. We learn from a ms letter of Dr. Goodman’s, that he desired them as a legacy, but received for answer, that they had been promised to archbishop Bancroft, upon whose death he transferred them to his successor Abbot, and archbishop Laud said they were deposited in the palace at Lambeth, but | whereever they were archbishop Sancroft could not find one of them. 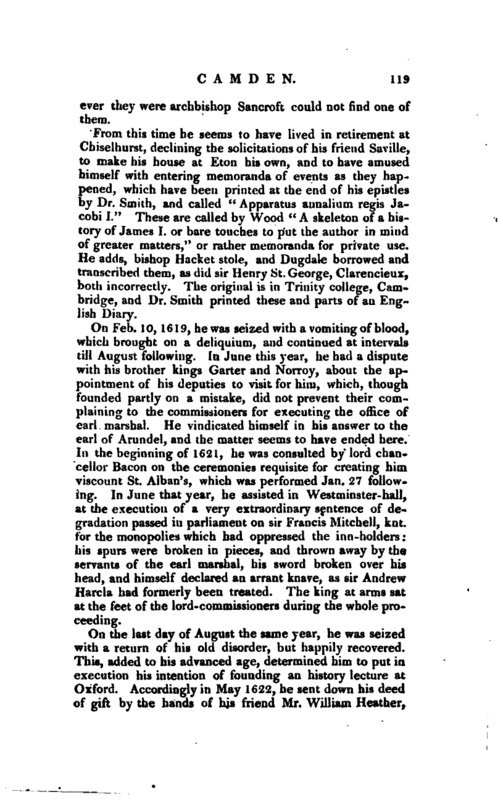 From this time he seems to have lived in retirement at Chiselhurst, declining the solicitations of his friend Saville, to make his house at Eton his own, and to have amused himself with entering memoranda of events as they happened,- which have been printed at the end of his epistles by Dr. Smith, and called “Apparatus annalium regis Jacobi I.” These are called by Wood “A skeleton of a history of James I. or bare touches to put the author in mind of greater matters,” or rather memoranda for private use. He adds, bishop Hacket stole, and Dugdale borrowed and transcribed them, as did sir Henry St. George, Clarencieux, both incorrectly. The original is in Trinity college, Cambridge, and Dr. Smith printed these and parts of an English Diary. On Feb. 10, 1619, he was seized with a vomiting of blood, which brought on a deliquium, and continued at intervals till August following. In June this year, he had a dispute with his brother kings Garter and Norroy, about the appointment of his deputies to visit for him, which, though founded partly on a mistake, did not prevent their complaining to the commissioners for executing the office of earl marshal. He vindicated himself in his answer to the earl of Arundel, and the matter seems to have ended here. In the beginning of 1621, he was consulted by lord chancellor Bacon on the ceremonies requisite for creating him viscount St. Alban’s, which was performed Jan. 27 following. In June that year, he assisted in Westminster- hall, at the execution of a very extraordinary sentence of degradation passed in parliament on sir Francis Mitchell, knt. for the monopolies which had oppressed the inn-holders: his spurs were broken in pieces, and thrown away by the servants of the earl marshal, his sword broken over his head, and himself declared an arrant knave, as sir Andrew Harcla had formerly been treated. The king at arms sat at the feet of the lord- commissioners during the whole proceeding. On the last day of August the same year, he was seized with a return of his old disorder, but happily recovered. This, added to his advanced age, determined him to put in execution his intention of founding an history lecture at Oxford. Accordingly in May 1622, he sent down his deed of gift by the hands of his friend Mr. William Heather, | dated March 5, 1621-2. On May 17, Dr. Piers, dean of Peterborough, and vice-chancellor of the university, declared the foundation in full convocation, and its endowment with the manor of Bexley in Kent, which he had bought of sir Henry Spihnan, jeweller to James I.; the rents and profits of which, valued at about 400l. per annum, were to be enjoyed by Mr. Heather, his heirs and executors, for ninety-nine years from the death of Mr. Camden, the said Mr. Heather paying the professor of this new foundation 140l. per annum; and at the expiration of the said term the whole to be vested in the university. They expressed their acknowledgments in a letter of thanks, and conferred the degree of doctor of music on Mr. Heather, organist of the chapel royal, and on Mr. Orlando Gibbons, another of Mr. Camden’s intimate acquaintance. In return for this compliment, Mr. Heather founded a music lecture at Oxford, and endowed it with the annual revenue of 16l. 6s. Sd. Mr. Camden himself, at the recommendation of his friend Thomas Allen, appointed his first professor Degory Wheare, A. M. fellow of Exeter college, assigned him 20l. for the first year, 40l. for the second, and after the third he was to enjoy the full stipend. 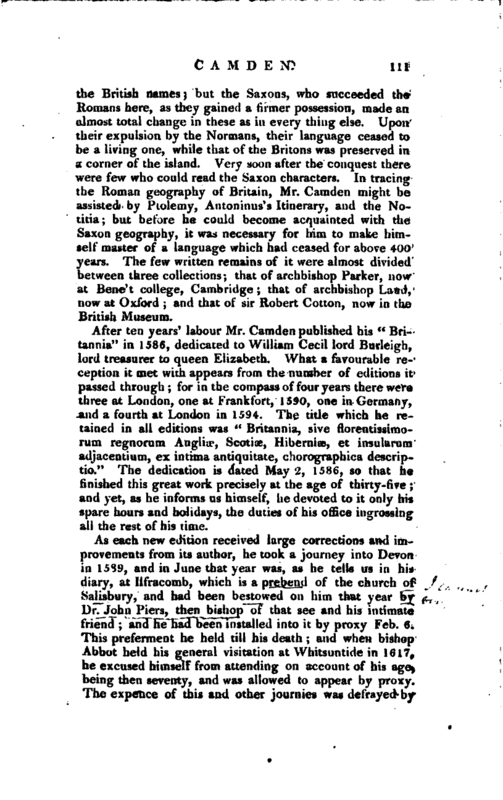 Thus Camden fulfilled the vow with which he closes his Britannia, to dedicate some votive tablet to God and antiquity. On August 18, 1623, as Mr. Camden was sitting thoughtfully in his chair, he suddenly lost the use of his hands and feet, and fell down on the floor, but presently recovered his strength, and got up again without receiving any hurt. This accident was followed by a severe fit of illness, which ended in his death, Nov. 9, 1623, at his house at Chiselhurst, in the seventy- third year of his age. In his last testament, after a devout introduction, and bequeathing eight pounds to the poor of the parish in which he should happen to die, he bequeaths to sir Fulke Grevile, lord Brooke, who preferred him gratis to his office, a piece of plate of ten pounds; to the company of painter stainers of London, he gave sixteen pounds to buy them a piece of plate, upon which he directed this inscription, “Gul. Camdenus Clarenceux filius Sampsonjs, Pictoris Londinensis, dono dedit;” he bestowed the sum of twelve pounds on the company of cordwainers, or shoemakers of London, to purchase them a piece of plate, on which the same inscription was to be engraved. Then follow the legacies to his private friends. As to his books and papers, he directs | that sir Robert Cotton of Conington, should take out such as he had borrowed of him, and then he bequeaths to him all his printed books and manuscripts, excepting such as concern arms and heraldry, which, with his ancient seals, he bequeaths to his successor in the office of Clarenceux, provided, because they cost him a considerable sum of money, he gave to his cousin John Wyat, what the kings at arms Garter and Norroy for the time being should think fit, and agreed also to leave them to his successor. But notwithstanding this disposition of his books and papers, Dr. John Williams, then dean of Westminster, and bishop of Lincoln, afterwards archbishop of York, procured all the printed books for the new library erected in the church of Westminster. 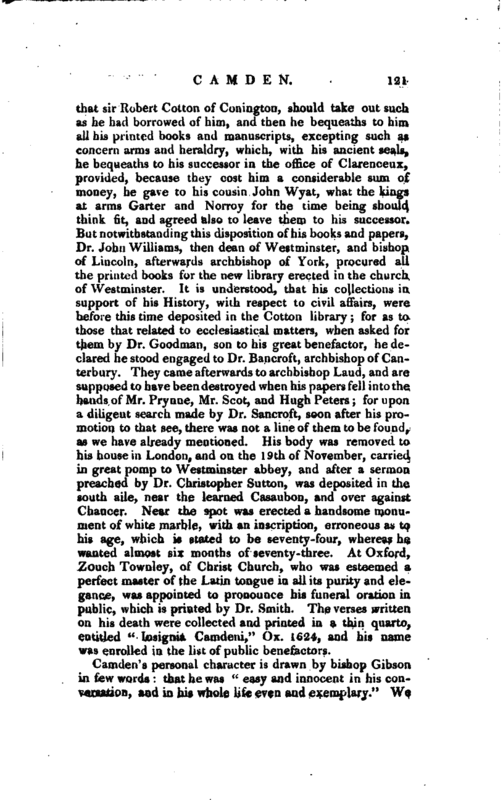 It is understood, that his collections in support of his History, with respect to civil affairs, were before this time deposited in the Cotton library; for as to those that related to ecclesiastical matters, when asked for them by Dr. Goodman, son to his great benefactor, he declared he stood engaged to Dr. Bancroft, archbishop of Canterbury. They came afterwards to archbishop Laud, and are supposed to have been destroyed when his papers fell into the hands of Mr. Prynne, Mr. Scot, and Hugh Peters; for upon a diligent search made by Dr. Sancroft, soon after his promotion to that see, there was not a line of them to be found, as we have already mentioned. His body was removed to his house in London, and on the 19th of November, carried in great pomp to Westminster abbey, and after a sermon preached by Dr. Christopher Sutton, was deposited in the south aile, near the learned Casaubon, and over against Chaucer. Near the spot was erected a handsome monument of white marble, with an inscription, erroneous as to his age, which is stated to be seventy-four, whereas he wanted almost six months of seventy-three. At Oxford, Zouch Townley, of Christ Church, who was esteemed a perfect master of the Latin tongue in all its purity and elegance, was appointed to pronounce his funeral oration in public, which is printed by Dr. Smith. The verses written on his death were collected and printed in a thin quarto, entitled “Insignia Camdeni,” Ox. 1624, and his name was enrolled in the list of public benefactors. Carnden’s personal character is drawn by bishop Gibson in few words: that he was “easy and innocent in his conversation, and in his whole life even and exemplary.” We | have seen him unruffled by the attacks of envy, which his merit and good fortune drew upon him. He seems to have studied that tranquillity of temper which the love of letters generally superinduces, and to which one may, perhaps, rationally ascribe his extended life. The point of view in which we are to set him, is as a writer; and here he stands foremost among British antiquaries. Varro, Strabo, and Pausanias, among the ancients, fall short in the comparison; and however we may be obliged to the two latter for their descriptions of the world, or a small portion of it, Camden’s description of Britain must be allowed the pre-eminence, even though we should admit that Leland marked out the plan, of which he filled up the outlines. A crowd of contemporaries, all admirable judges of literary merit, and his correspondents, bear testimony to his merit. Among these may be reckoned Ortelius, Lipsius, Scaliger, Casaubon, Merula, De Thou, Du Chesne, Peiresc, Bignon, Jaque Godefre, Gruter, Hottoman, Du Laet, Chytraeus, Gevartius, Lindenbrogius, Mercator, Pontanus, Du Puy, Rutgersius, Schottus, Sweertius, Liinier, with many others of inferior note. 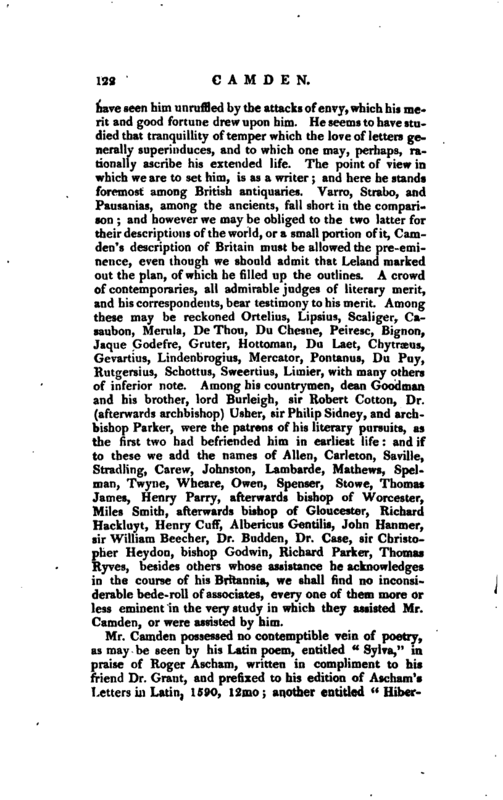 Among his countrymen, dean Goodman and his brother, lord Burleigh, sir Robert Cotton, Dr. (afterwards archbishop) Usher, sir Philip Sidney, and archbishop Parker, were the patrons of his literary pursuits, as the first two had befriended him in earliest life: and if to these we add the names of Allen, Carleton, Saville, Stradling, Carew, Johnston, Lambarde, Mathews, Spelroan, Twyne, Wheare, Owen, Spenser, Stowe, Thomas James, Henry Parry, afterwards bishop of Worcester, Miles Smith, afterwards bishop of Gloucester, Richard Hackluyt, Henry Cuff, Albericus Gentilis, John Hanmer, sir William Beecher, Dr. Budden, Dr. Case, sir Christopher Hey don, bishop Godwin, Richard Parker, Thomas Ryves, besides others whose assistance he acknowledges in the course of his Britannia, we shall find no inconsiderable bede-roll of associates, every one of them more or less eminent in the very study in which they assisted Mr. Camden, or were assisted by him. Mr. Camden possessed no contemptible vein of poetry, as may be seen by his Latin poem, entitled “Sylva,” in praise of Roger Ascham, written in compliment to his friend Dr. Grant, and prefixed to his edition of Ascham’s Letters in Latin, 1590, 12mo; another entitled “| Hibernia an hexastich prefixed to Hakluyt’s Voyages another to sir Clement Edmondes’ translation of Cæsar’s Commentaries another to Thomas Rogers’ s” Anatomy of the human mind, 7 ’ 1576, 12mo. He wrote also ten epitaphs, the most remarkable of which is that for the queen of Scots. The marriage of the Tame and Isis, of which he more than half confesses himself the author, does honour to his fancy, style, and numbers. The first edition of his Britannia was in 1586, 8vo, and not 4to, as Mr. Gough, probably by a slip t)f the pen, has noted; and the sixth and last was in 1607, fol. This was the first with maps. There were also several editions printed abroad. The first translation of it was in 1610, by Philemon Holland, who was thought to have consulted Mr. Camden himself, and therefore great regard has been paid by subsequent editors to his additions and explanations. Mr. Camden’s ms supplement to this edition of 1610, in the Bodleian library, expressly cautions the reader to hold only his “Latin copy for autentiq,” but this* bishop Gibson denies; but in a later edition of his translation, 1637, fol. Holland has taken unwarrantable liberties. Mr. Wanley supposes this second edition was published after Holland’s death in 1636, the title being like a bookseller’s; and that he made the translation without consulting Camden. The Britannia was translated in 1694 by bishop Gibson, and published in folio, with large additions at the end of each county; others are inserted in the body of the book, distinguished from the original, and Holland’s most material notes placed at the bottom of each page. As this was grown scarce, and many improvements were communicated to the editor, he published a new edition 1722, 2 vols. fol. and additions, greatly enlarged, incorporated with the text, distinguished by hooks. This edition was reprinted 1753, 2 vols. fol. and again in 1772, with a few corrections and improvements from his lordship’s ms. in his own copy, by his son-in-law, George Scot, esq. of Wolstonhall, near Chigwell, Essex, who died 1780. A first volume of a translation, by W. O. (William Oldys), esq. was printed in 4to, but, as Mr. Gough thinks, was never finished or dated. A manuscript most erroneous translation of it, without acknowledgment, by Richard Butcher, author of the “Antiquities of Stamford,” is in St. John’s | college library, Cambridge, with a few immaterial additions. The last and most complete translation of the Britannia, by such an antiquary as Camden would have chosen, the late learned and excellent Richard Gough, esq. was published in 1789, 3 vols. fol. of which we shall speak more at large in his article. Some years afterwards he had made preparations for a new edition, of which he superintended only the first volume, and announced that fact in a public advertisement, which did not, however, prevent an attempt to pass off the whole of a recent edition as his. Of Mr. Cough’s Life of Camden we have here availed ourselves, as far preferable to the ill-digested compilation in the Biog. Britannica. Life in Cough’s Camden.—Biog. Brit.—Life by Smith, 1691, 4to.—Ath. Ox. vol. I. &c.